Recipes from Amish kitchens, passed down through generations, tend to combine simple ingredients into something simply delicious. Amish Farmhouse Sugar Cookies are a crunchy, melt-in-your-mouth treat made with just a few pantry staples. Bake some to share and some to fill your own cookie jar! Hi! I’m Wendy, the sprinkle loving, care package creating, baker at The Monday Box. My specialty is care package recipes for baked goods that travel well and stay fresh for a long time. Of course, my recipes are just as delicious enjoyed at home! I am excited to share some of my recipes here with you in a series of guest posts linking children’s picture books and baking! When I started The Monday Box, 7 years ago, my son had just started college. I wanted to send him a care package filled with home baked love. Honestly, he would have been just as delighted with commercial cookies, but baking and sharing was therapeutic for me. I benefited while creating, and my son benefited while munching. However, I couldn’t find a resource for care package recipes. Most baking recipes don’t tell you how long a cookie or bar will stay fresh. I decided to publish my own care package recipe resource and created The Monday Box. At first, I published recipes with only college care packages in mind, but over the years my care package focus has expanded to include a variety of purposes. As an enthusiastic member of Soldiers Angels Deployed Adoptions team, I send monthly themed military care packages, with baked goodies that match the theme, to my “adopted” service members. I document those care packages and share the recipes on The Monday Box. This guest post series will focus on another care package connection, baking for children. Whether you are baking for your own children, grandchildren, nieces, nephews, or friends, these book themed treats are sure to cause lots of smiles. Feature a children’s picture book to read with your little ones. Provide a recipe for a baked treat that ties to the book. Offer tips for sharing, mailing, and enjoying the books and baked goods. 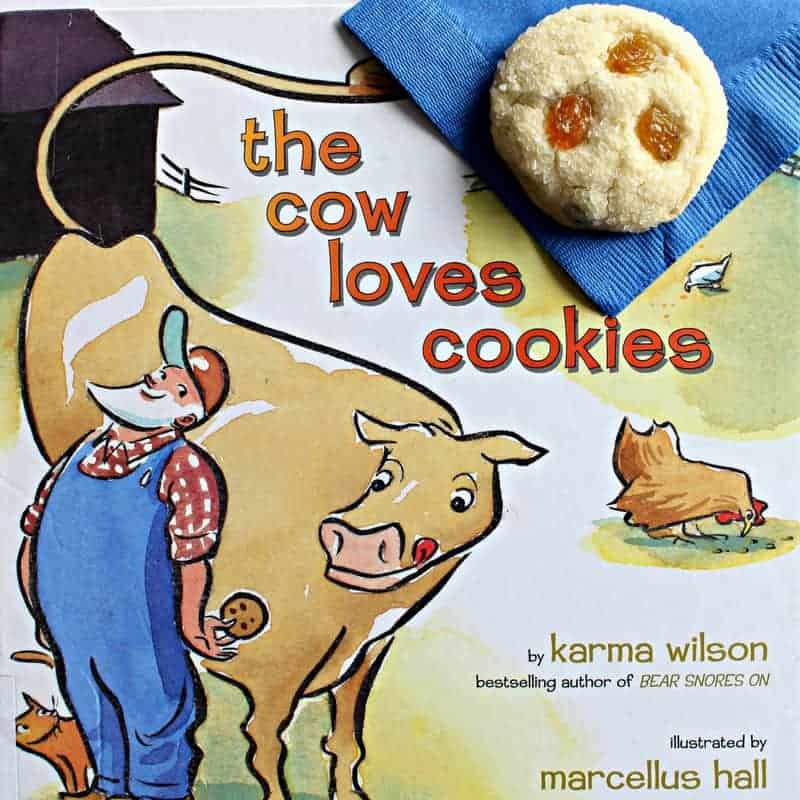 This month’s featured book is “The Cow Loves Cookies” by Karma Wilson. Told in rhyme, the story follows the farmer as he feeds his many animals. All of the animals eat normal farm animal food, except for the cow who loves cookies! The cow has a deal worked out with the farmer. The farmer provides the cookies, and the cow provides the milk! The author doesn’t tell us specifically what kind of cookie the cow loves. (I think she probably loves all cookies.) Amish Farmhouse Sugar Cookies would definitely be a good choice. 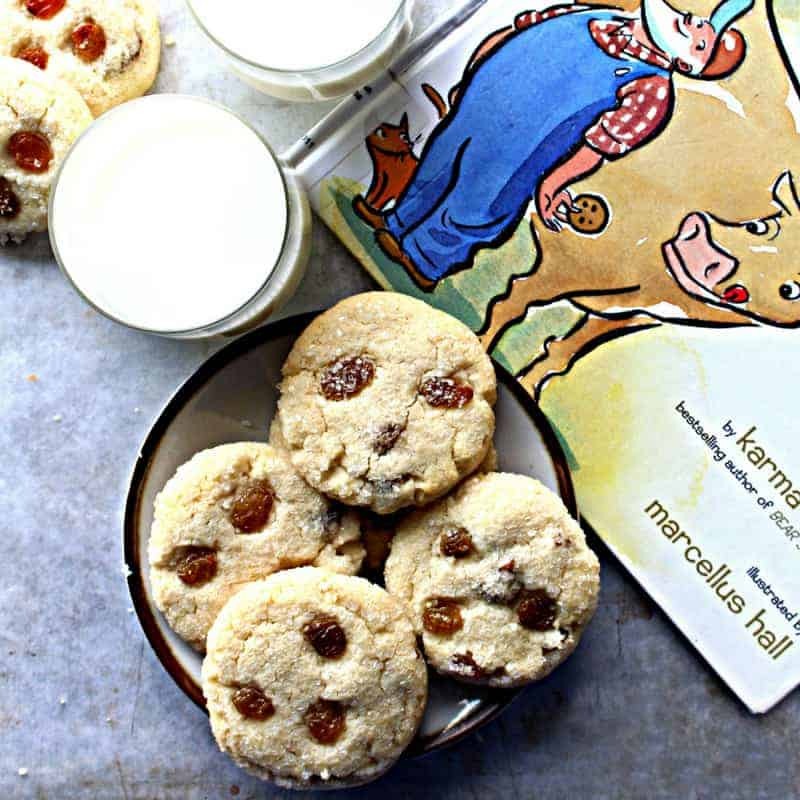 The illustrations show the Farmer and the cow eating a speckled cookie. 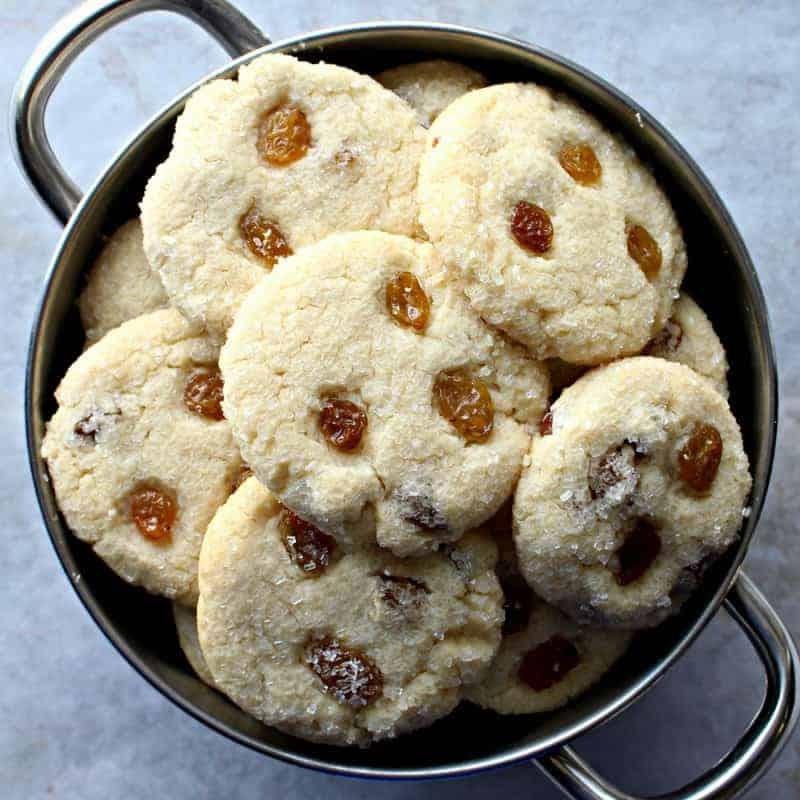 I thought about what the speckles could be and chose to make my cookies speckled with raisins. My suggestion is that you read this book to the wee ones in your life, then share some milk and cookies. Reading snuggled up together is optimal, but if distance makes that impossible, send a care package filled with Amish Farmhouse Sugar Cookies and have a story time video chat! Does your family have a favorite picture book? Is there a book you would like to see featured? Let me know in the comments! In a large mixing bowl, whisk together flour, baking soda, cream of tartar, and salt. Set aside. In the bowl of an electric mixer, beat butter, oil, and both sugars for about 3 minutes, until light and fluffy. Mix in the eggs one at a time. Then mix in the vanilla. Gradually add the dry ingredients until just combined. Overmixing will produce a less tender cookie. Pour decorating sugar into a small shallow bowl. Use a medium (2 tablespoon) scoop to portion the dough. Roll each dough ball in decorating sugar. Place coated dough balls 2” apart the prepared baking sheet. Flatten each ball slightly with the palm of your hand. 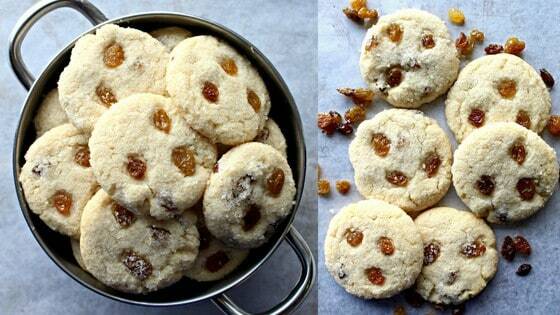 Add a few raisins on top of each cookie. 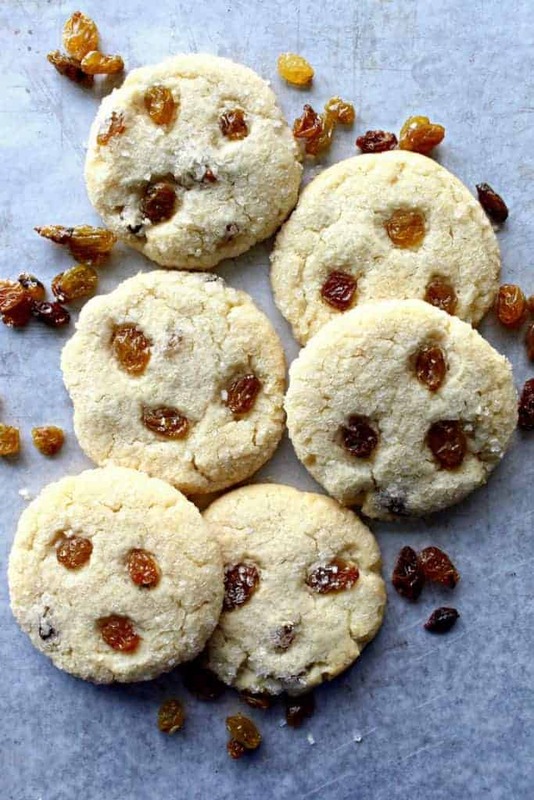 The raisins will not stick well to the sugared surface until baked. Bake for 8-9 minutes. Tops of cookies will not darken. Bottom edges of cookies will have just begun to turn golden brown. Do not overbake or the cookies will be dry. Wendy Sondov is the recipe developer, baker, photographer, and care package creator for The Monday Box, the only care package recipe blog. All of the recipes on The Monday Box are for baked goods that travel well and stay fresh for a long time. Get recipes for home baked love sent straight to your inbox by signing up here!